A BIG Thanks To YOU – People’s Choice Award! 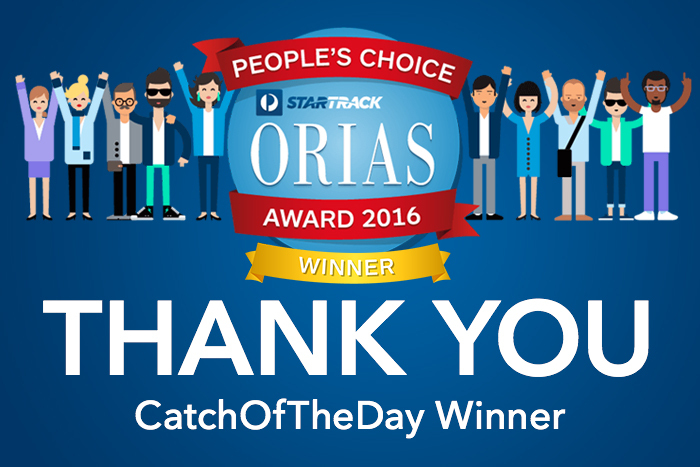 On the night of Thursday, July 21 some of the team from Catch Of The Day travelled to Sydney to attend the StarTrack 2016 ORIAS – the online retail industry awards night. All dressed up in smart looking attire (quite different to what we usually wear here at Catch), we were lucky enough to come back with a pretty good looking trophy. Catch Of The Day has been awarded the 2016 People’s Choice Award, and of course we have you to thank for that! We value your opinions and feedback and we’re super excited that we got to win such a prestigious award within the online retail industry. Ranked by The 2016 E-Commerce Leaders Playbook as the 3rd biggest retail site in Australia, we are driven to offer you all great deals every single day. We have over 10,000 different items on sale, including brands like Nike, Adidas, Calvin Klein, Michael Kors, Marc Jacobs and everyday items at incredibly low prices – as you would know! Our site is perfect for online shoppers who love a bargain, and we know how much you guys love the real deal! “To win is a great honour and an achievement and we owe it to our dedicated team as well as our consumers,” Head of Customer Service, Adam Rudy says. “The People’s Choice Award is based on customer votes, so it gives a true representation on what the people of Australia really think.” Our Customer Service team is constantly sorting out any issues on the spot, and is there when you need them most whether it be via email, phone or live chat. It also gives you the chance to contact us to ask any questions before snapping up a great deal. Catchoftheday.com.au sells an item every few seconds, and ships out over 8,000 orders per day. With the helping hand of automated picking robots in our massive 25000m² warehouse, we do what we can to ensure your parcels are packaged securely and dropped off at your door as fast as possible. We couldn’t have kept our customers as happy as they are without the service that AusPost delivers every day. Thanks again, for the win! Next Next post: Congratulations to our Click Frenzy Giveaway WINNERS!